If you’re not paying attention, the Miradouro Keil do Amaral can go completely unnoticed in the middle of the forest of Monsanto. In my opinion it is a magical place in which I like to go for a walk on a Sunday morning and read a book. You will feel in perfect harmony with the disposition of all the elements – the pine trees offering freshness and shade and the water element being present with a beautiful triangular lake close to the ground. 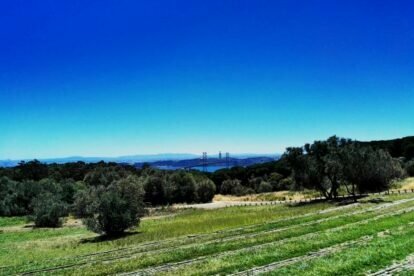 It seems like an arena from the Roman times and you can do lots of activities, but the most amazing aspect is that you will be able to contemplate the panorama over Lisbon. You will see the river, the Ponte 25 de Abril and the whole of Lisbon under your feet. The surrounding environment is intimate and very romantic, as if nature wanted to share with us this little secret of the Serra de Monsanto. You can try having a picnic and enjoy the great Portuguese weather almost all year. Go and enjoy the romance this place has to offer.